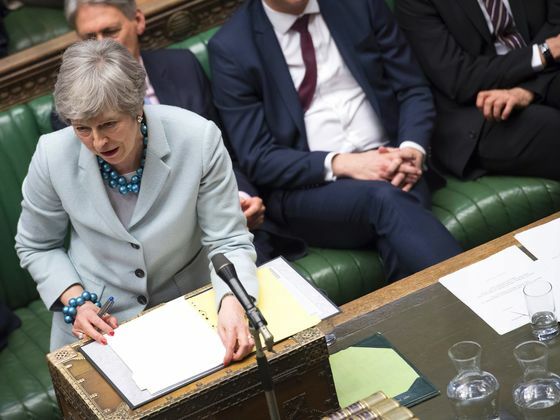 (Bloomberg) -- The biggest selling point of Brexit was about “taking back control” of the country’s destiny and it was Theresa May’s most frequent refrain as she fought and lost the battle to get her divorce deal from the European Union over the line. But in a vote in Parliament late last night, the prime minister lost control of the process as the world looks on in dismay. So who is in charge? It will be up to the elected politicians in the House of Commons to try and find a path forward in the coming days by possibly literally jotting down on a piece of paper their preference, from a second referendum to keeping the U.K. in the bloc’s customs union, leaving without a deal and even canceling Brexit altogether. It’s something virtually without precedent, that the fate of Brexit could be decided in this unorthodox way. There’s the added complication that these so-called “indicative votes” are not binding. May could well decide any consensus that might emerge would be so anathema to the Conservative Party’s election pledges that she simply would not support it. May has the threat of an early election or the risk that Brexit will be abandoned to try and force hardliners to back her deal in one final push. Trump unbound | The White House is showing signs that the completion of Special Counsel Robert Mueller's report — and the news that no one else will be charged as part of that probe into Russian election meddling and obstruction of justice — could embolden President Donald Trump’s approach to policy goals. The administration yesterday hardened its legal position toward Obamacare, a move that promises to inject the issue into the 2020 campaign, and green-lighted plans to use as much as $1 billion in military funds to build a wall on the Mexico border. House Democrats have requested the full report by April 2, and Trump is likely to play a key role in determining how much of the document is released. Click here for more about how Attorney General William Barr has become a key figure in interpreting the report's conclusions after just five weeks on the job. Click here to read why Republicans now want an investigation of the Mueller probe's roots. Israel strikes | Israeli warplanes and tanks launched new attacks on the Gaza strip early today after a night of rocket barrages from the Hamas-run territory and retaliatory air raids defied the militant group’s claims that Egypt had brokered a truce. Prime Minister Benjamin Netanyahu rushed home from Washington to deal with the flare-up in violence just two weeks before a close-fought election. Tehran tension | Trump’s national security team is divided over whether to let a small group of countries keep buying Iranian oil after a U.S. deadline on sanctions waivers expires in May. And, as Nick Wadhams and Margaret Talev report, the fight is getting ugly. For now at least, the president is staying above the fray. Venezuela blackouts | Just 10 days after Venezuela restored power to most residents following a week-long blackout that President Nicolas Maduro's government blamed on a U.S. cyber attack, the lights went out again yesterday. The authorities, after two hours of silence, said the system was back on line. National Assembly leader Juan Guaido said the failure had affected 17 states and 57 percent of the country. Senate Majority Leader Mitch McConnell is planning a vote as soon as today on Democrats’ broad climate change plan — known as the Green New Deal — in an attempt to expose their divisions and put 2020 presidential contenders in an awkward spot. U.S. officials overseeing aviation safety are due to testify tomorrow before a Senate Commerce Committee panel amid increasing scrutiny of the certification of Boeing’s latest 737 jetliner following two recent crashes that claimed 346 lives. And finally... The powerful U.S. gun lobby is making waves overseas. Representatives of Australia’s anti-Muslim immigration One Nation party were secretly filmed by the news network Al Jazeera asking the National Rifle Association for millions of dollars in funding in return for help in weakening laws restricting gun ownership in Australia. One Nation’s appeal in September came just three months after Australia passed legislation banning overseas interests donating more than A$250 to political parties.